Star trails show the effect of the Earth's rotation on long exposures, in the case of this image a full three hours. 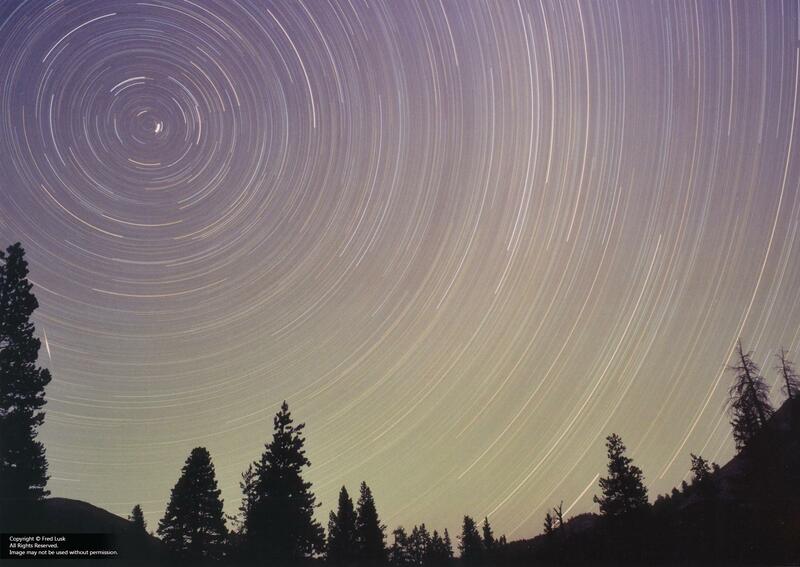 Polaris (the North Star) lies only 0.75° from the celestial pole and makes the tightest of the bright arcs. There is also a short meteor trail just to the right of the large tree on the left edge. Star trails are by far the easiest form of astrophotography. On film, it takes just one long exposure. Star trails can also be done on digital by stacking multiple images. This image earned an Honorable Mention at the 2003 Big Fresno Fair in the Color Scenery division. Exposure was exactly three hours (to the nearest minute). Boot's Camera handled developing and scanning the negatives. There was a small scratch on the negative that Boot's edited out for me on the digital file. The rest of the exposure data is missing, but the following is what I likely did:  Film was probably Kodak Royal Gold 100. Lens aperture was probably f/4 or f/5.6.